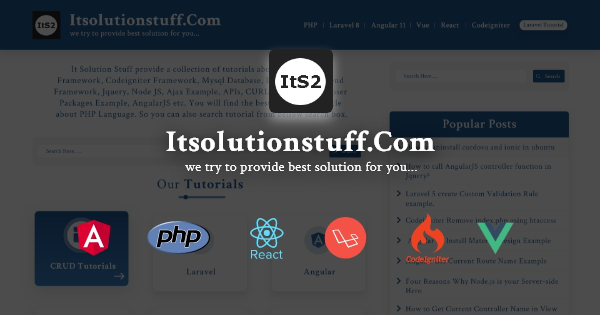 It Solution Stuff provide a collection of tutorials about PHP, Laravel Framework, Codeigniter Framework, Mysql Database, Bootstrap Front-end Framework, Jquery, Node JS, Ajax Example, APIs, CURL Example, Composer Packages Example, AngularJS etc. You will find the best example an article about PHP Language. So you can also search tutorial from bellow search box. How to fix and recover a “corrupt history file” in zsh? How to check empty or null in Mysql Query? How to copy one table data into another table using Mysql Query? How to implement flash messages in PHP Codeigniter? How to get php.ini file path? How to add charts in Laravel 5 using Chart JS ? How to copy to clipboard without flash in AngularJS ? How to get Ip Address in Codeigniter?